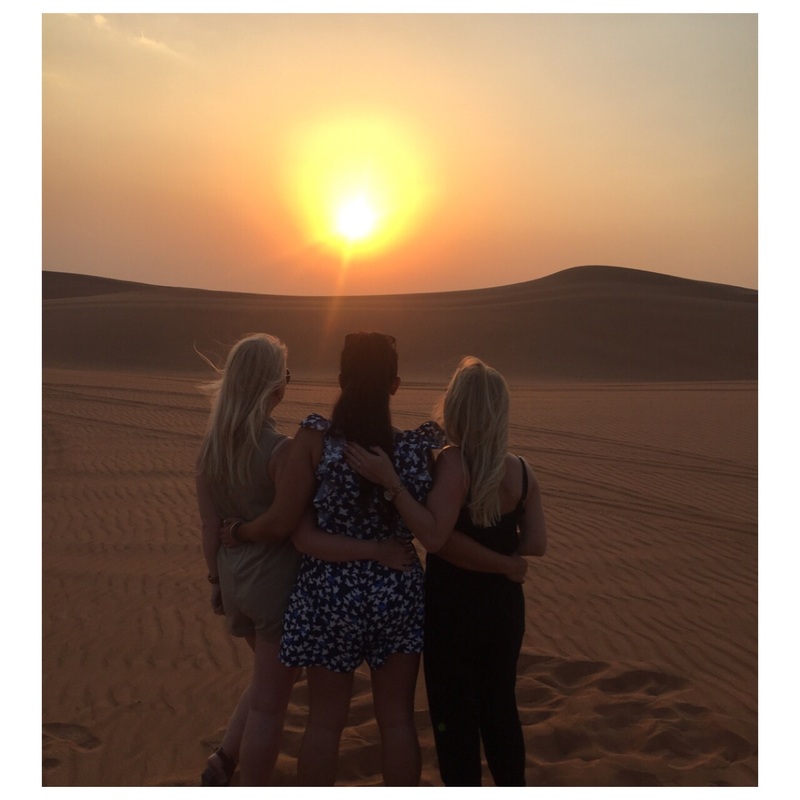 We went dune bashing in the desert with Arabian Adventures. 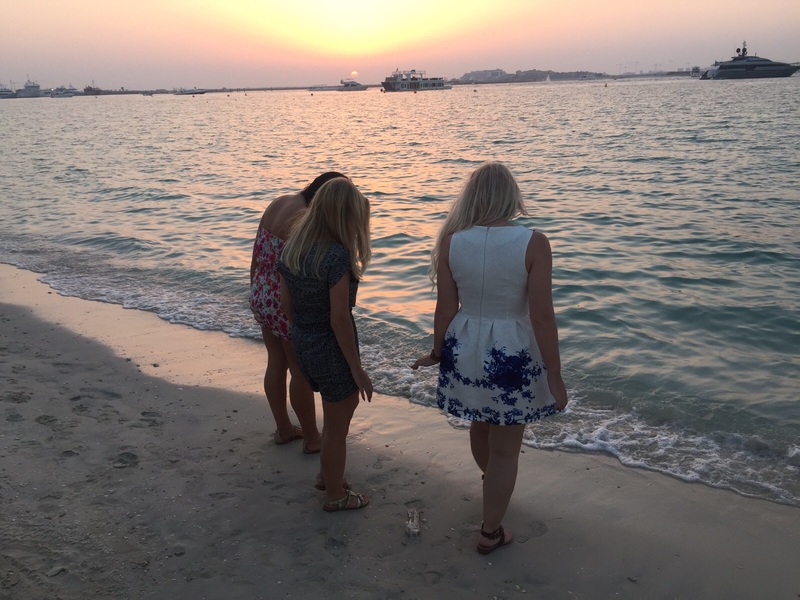 It was a great trip and really good value for money as it only cost us 500AED (about £90) for all three of us. The 4×4 driver picked us up from where we were staying (at my bestie’s dad’s house) and took us into the desert. There was the option of quad biking which was a little bit extra and we didn’t trust our holiday insurance quite enough to do it and then we headed off for the dune bashing. This was truly quite scary – it felt as if the car was literally going to tip over! We had a crazy driver who I think was made all the more crazy the more we screamed! There was also a beautiful sunset and we took full advantage of this photo opportunity. Is there anything more beautiful than a sunset? 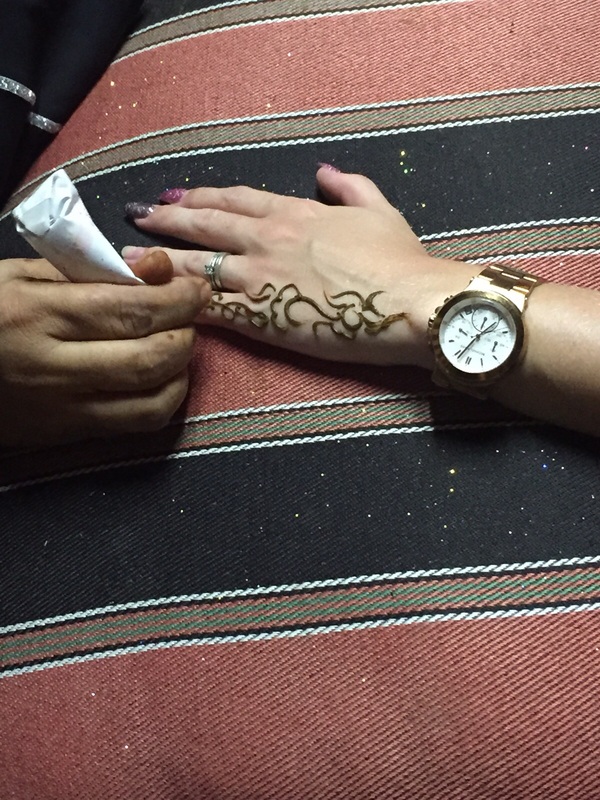 After the actual dune bashing, we were driven to a desert camp where we rode on camels, had henna tattoos on our hands and ate delicious food from the BBQ. There was also a belly dancer and a guy that twirled around about a million times without getting dizzy and hubbly bubbly pipes. 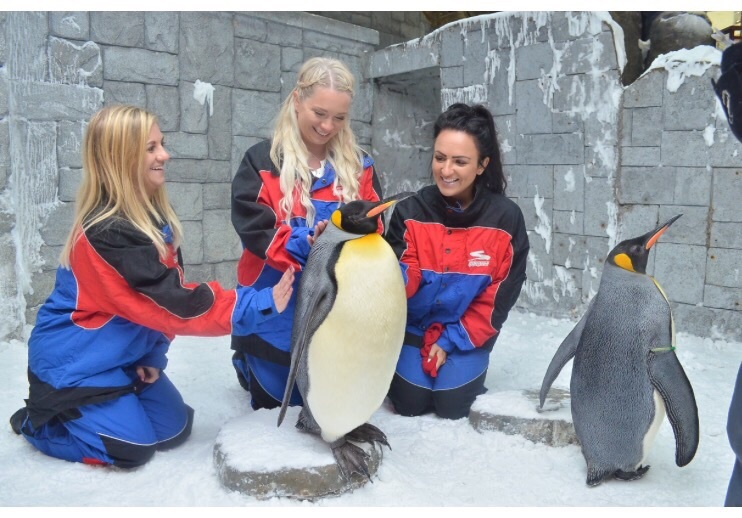 From the desert to the arctic, we met up with some feathered friends at Ski Dubai at the Mall of the Emirates. Yes, this huge shopping mall which boasts amazing shops like Miu Miu, Max Mara and Stella McCartney, also has a ski slope with real snow. We went for the Pengfriend Encounter where we got to meet two different breeds of penguin. We got to stroke them and give them a cuddle – they were really soft to the touch and not how I expected them to feel at all. If you love cheesecake (who doesn’t?) 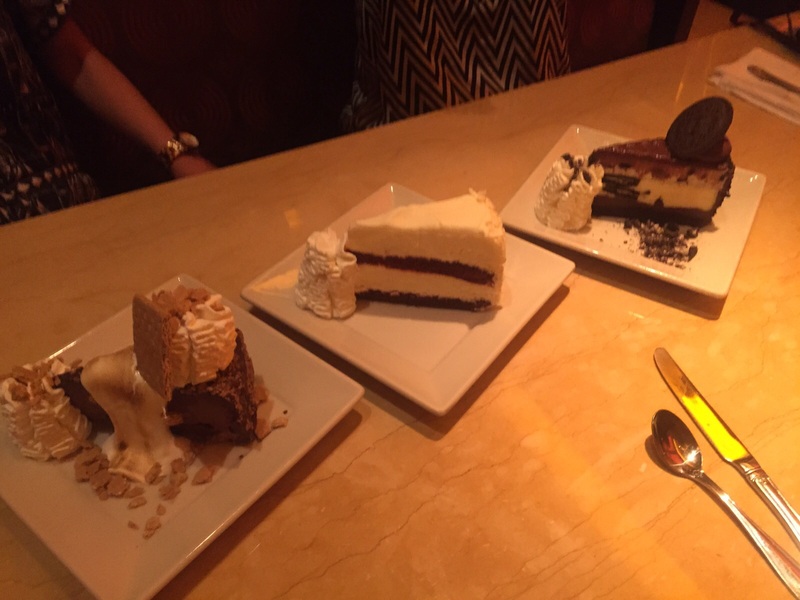 you should definitely head to The Cheesecake Factory as they do every kind of cheesecake imaginable. 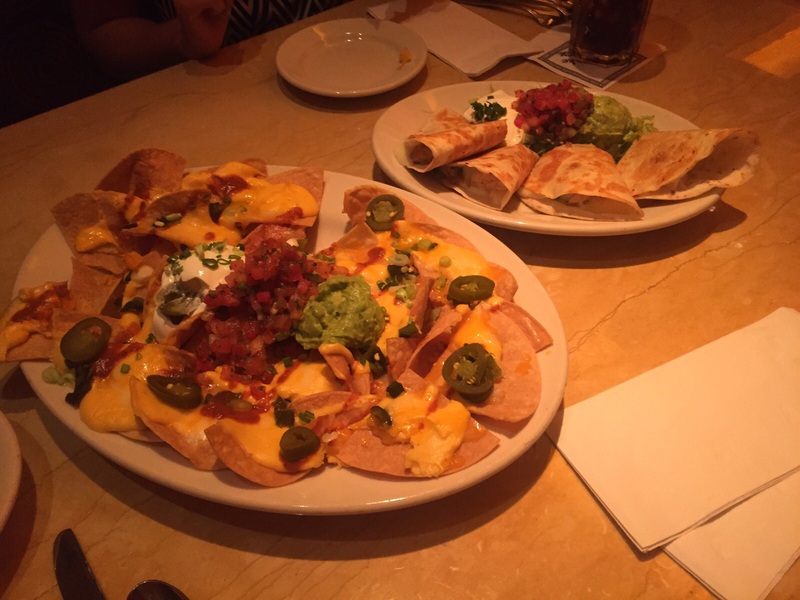 The portions are HUGE so make sure you save some room for the actual cheesecake – we had three starters between us, nachos, chicken strips and quesadillas, and we didn’t even manage to finish these. I chose the red velvet cheesecake and I must admit it was super sweet and sickly! Top Tip: Make sure you remember where you put your leftover cheesecake for when you get in after your night out! With Dubai being in a Muslim country, I wasn’t really expecting there to be a big party atmosphere but I was completely wrong. You can only drink in hotels but Tuesday is Ladies’ Night in the city where you are rewarded for being a girl with free drinks. We went to the Madame Butterfly Ladies’ Night at China Grill at the Westin hotel where there was a band playing and bubbles were on tap all night. In fact, you didn’t even need to go to the bar to get a round in, waiters came round and topped up your glass every time it got half empty. We then headed upstairs to a nightclub which I think was called Bussola. We had a great night, got invited to about a million after parties and danced until we couldn’t walk. In fact, I had TOO much fun as I was pretty much out of action for the whole of the next day and I didn’t leave the house. 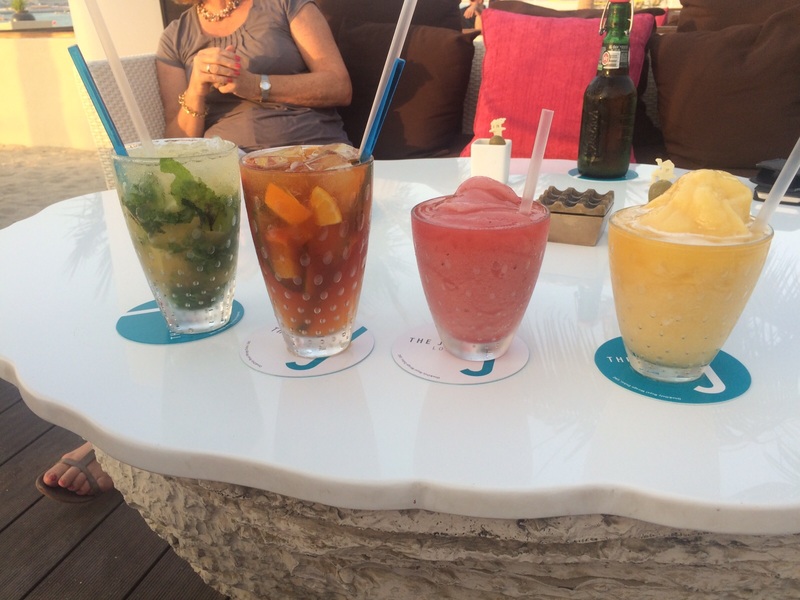 Drinking cocktails at sundown on the beach – what more can I say? WHY are sunsets in other countries the most beautiful thing? We went to <a “href=”http://royalmirage.oneandonlyresorts.com/cuisine/barsandclubs/jettylounge.aspx” target=”_blank” title=”The Jetty Lounge” alt=”The Jetty Lounge”>The Jetty Lounge at the One & Only for ours and drank delicious daiquiris right by the sea front as we watched the sun disappear. Again, this is somewhat of a boozy affair. Weekends in the UAE fall on Fridays and Saturdays and so Friday is a big party day. We headed to the Grand Grill Steakhouse for brunch which was 350AED (about £62) for all you can eat and drink from 12.30 – 4pm. Apparently this was one of the more limited brunches in terms of food but it was fine for me. There was a selection of salads, BBQ items like burgers, ribs, chicken drumsticks, and steaks which were cooked to order. 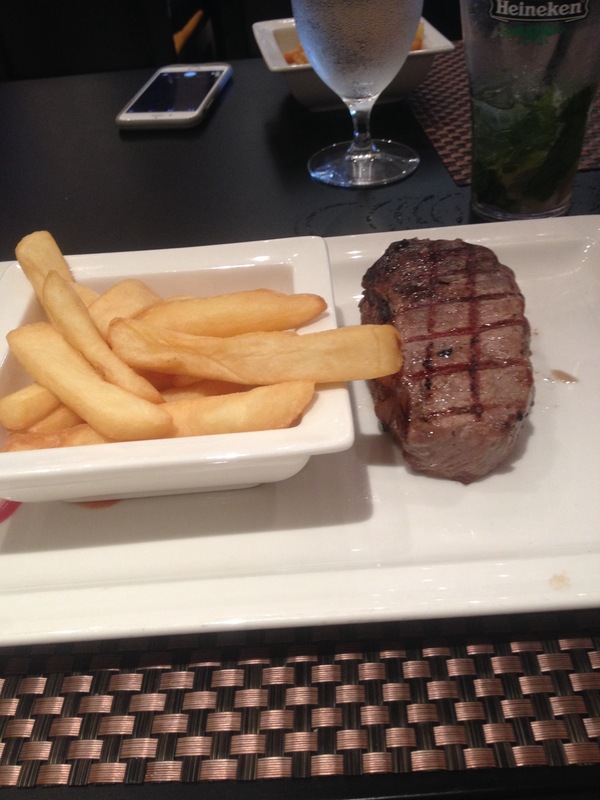 I chose the sirloin steak, rare of course, and it was cooked to perfection. 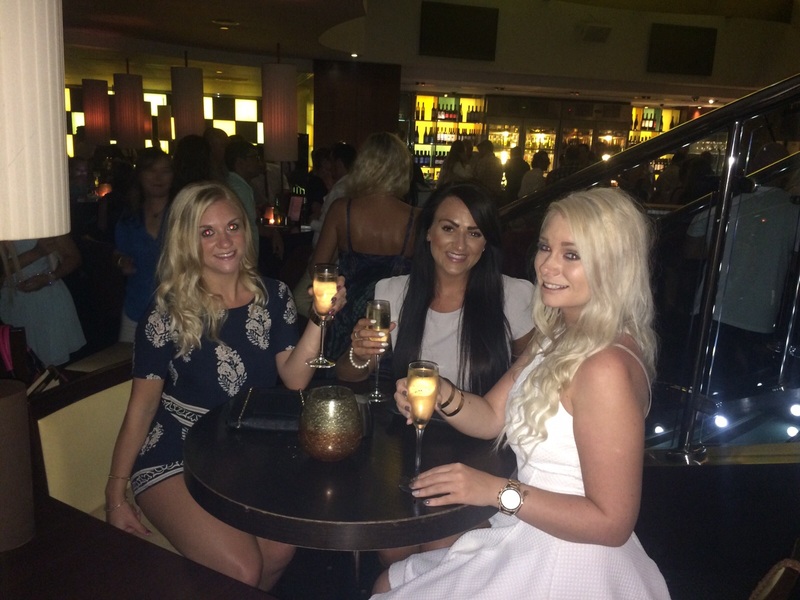 The drinks were good too – there was wine on offer, cocktails and spirits. Everyone gets really dressed up for brunch and then (if you can handle it!) it’s on to the next bars. This brunch did start to get a little bit rowdy — there was a rugby team on the table next to us so it wasn’t long before we got roped into playing a drinking game with them! 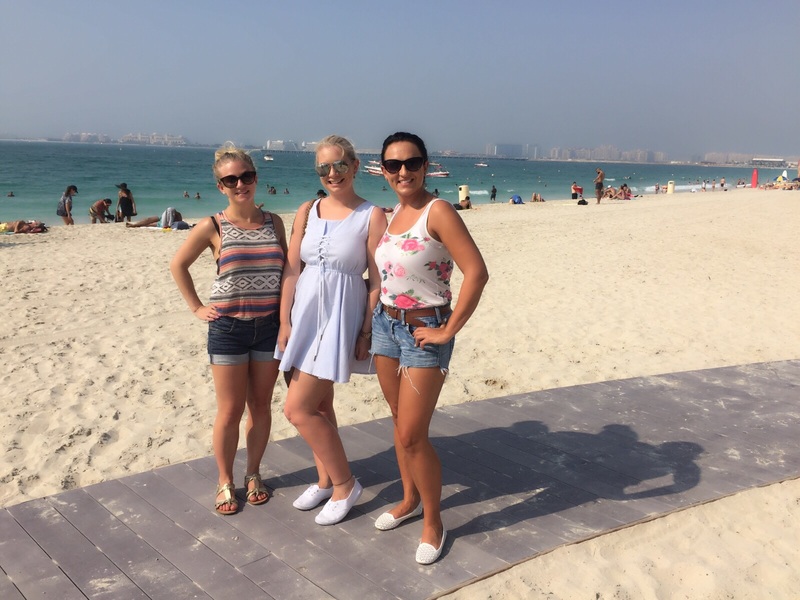 We then went to Candypants at XL at the Habtoor Grand Beach Resort & Spa, The Observatory at the Marriott and Level 43 at Four Points by Sheraton. We ended up getting home at 3.30am! I love the finer things in life and seeing the coast of Dubai on a yacht is definitely one of them. We were lucky enough to be taken out on a boat but you can hire a yacht from the harbour and it’s quite reasonable. There’s nothing better than sitting on the front of the boat, sipping on bubbles and feeling the wind in your hair before jumping off for a swim in the Arabian Sea – and it’s warm – like a bath! You get a great view of the Atlantis and the Burj Al Arab, plus the rest of the buildings in Dubai. We were all keen to chill big time on this holiday, get away from work and all the stresses at home and completely relax. The weather was amazing – it was around 38 degrees every single day and it was lovely to wake up to beaming sunshine every morning which put me in a great mood. It took me at least half an hour to completely forget that this wasn’t my real life. On holiday I like to put in the hours sunbathing in order to work hard on my tan – I usually lay out at least from 9 til 5! On some days, it was just too humid for this and so there was a lot of dipping into the pool or popping inside to get a blast from the air con but I still managed to finish almost two books. We didn’t really spend much time on the beach, but we went for a lovely walk one day and had breakfast pastries on the beachfront on another day. The sand was beautiful and white and there was a really cool girl DJ playing some good tunes, everything you would want from a beach. 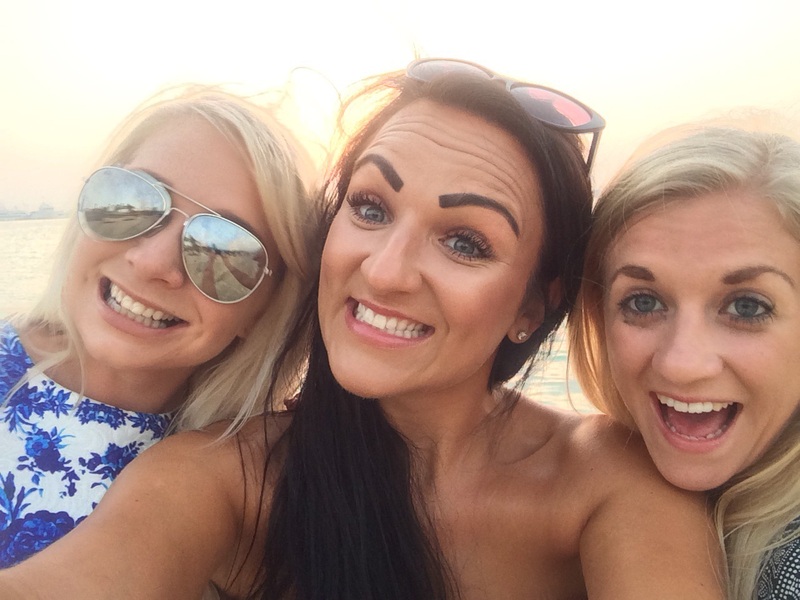 If you’ve visited Dubai before, let me know your top tips below! Dubai is awesome place for desert safari! It definitely is – can’t wait to go again!